William McInnes will present the ‘Boofhead’s Guide To Bird Watching’ in Hello Birdy, a new series coming to ABC1. During this six-part series, William gets up close and personal with some of Australia’s diverse birdlife. With his offbeat sense of humour and a weird bag of tricks, William takes viewers on a refreshing journey to observe Australia’s incredibly rich birdlife and the people who work alongside them. From the iconic emu through to the consummate mimic the lyrebird, experience bird watching like never before. Join William McInnes saying Hello Birdy – you’ll never feel quite the same about Australian birds once you do. In the first episode William meets Wildlife Officer John Martin and Adrian Davis from the University of Sydney who are using Facebook to monitor the movements of dozens of Sulphur-crested Cockatoos around Sydney. William climbs a tree to see one of John’s favourite cockies, Lily. He helps install a motion-activated video camera to monitor her. In Darwin, William gets a chance to investigate why so many Red-collared Lorikeets are being found apparently drunk. 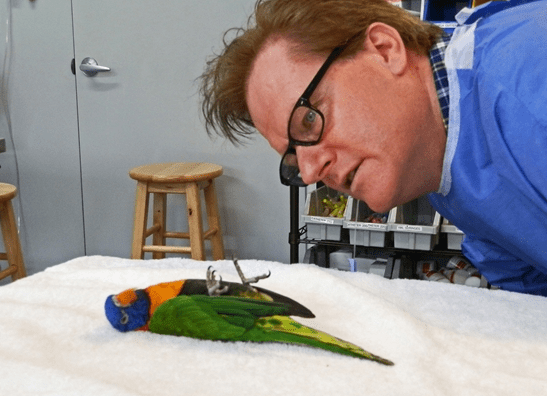 He joins Dr Stephen Cutter to see if he can help uncover the truth of one of the mysteries of the parrot world. Next up, William is in Tasmania to investigate the welfare of one of the rarest birds in the world – the Orange-bellied Parrot. He joins Mark Holdsworth and spends an afternoon banding and measuring the ‘little avocados’. But in Australia not all parrots are rare. Every summer, the village of Strathalbyn in South Australia is afflicted by the curse of tens of thousands of Little Corellas. William meets Paul Willcock who uses a falcon named Bonnie to scare them away. Bonnie might just be moving the birds to another location so William comes up with a novel suggestion – if you can’t beat ‘em join ‘em. Create a ‘Corella Festival’ and celebrate them instead! 6:30pm Saturday, 1 February ABC1. Good to see the ABC supporting a genuine Aussie Bloke talking about our fauna as we would! The best thing about being an Aussie is our ‘uniqueness’ and William McInnes represents our humour and take on life. I’m loving learning with a laugh factor. If it makes you laugh you’ll remember it. (Resists urge to quote Monty Python) Don’t worry – the parrot is in all likelihood drunk on fermented fruit, not dead.